This mid-December high school senior engagement session was a joy to work on. After starting at her high school and giving her some time to warm up to me, we relocated the session to her grandma's house a short drive away. The late fall sun was setting over the field behind her and the last few rays of light were filtering through the branches on the trees behind her, creating a hazy background. This ethereal feel was balanced nicely with the use of an off camera flash just to her right. Anytime I have the chance to use late afternoon light that is filtered, I jump! In some cases I use it as the main light for the image, allowing it to be the primary source of light on my subject. But when the light creates the kind of haze and glow like it did here, it becomes defining and takes on it's own life. Using the correct angle in relation to the sun is very important. Too much towards the sun and you lose the hazy feel and replace it with all sorts of lens flare, which is appropriate and fun at times but not for this senior portrait. Too far away from the light and the haze disappears. The next challenge is to make the flash blend seamlessly with the haze without losing the haze. 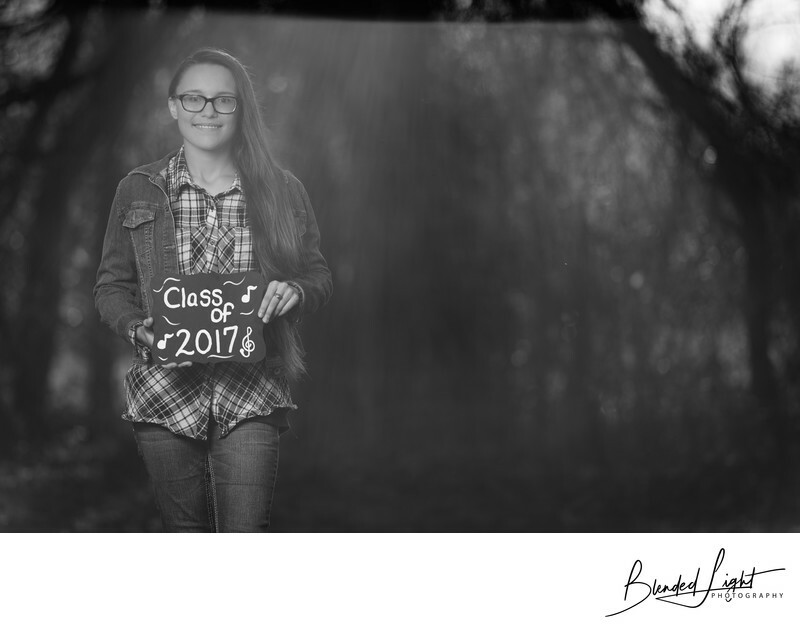 This senior session set was gorgeous from the get go and my client was absolutely awesome in her posing, most of which she did on her own naturally, and her understanding of my end goal for her. She set the standard high for her spring session when she gets her cap and gown! Location: 700 E Booker Dairy Rd, Smithfield, NC. 1/800; f/2.8; ISO 100; 190.0 mm.